Drawing Pad is a painting tool with an impressive array of features that can transform your iPad tablet into a portable art studio and virtual canvas. Developed by Murtha Design, it is the perfect drawing app for kids and adults. The app combines the sophistication of high end graphics software and the simplicity of mobile drawing tool. It is optimized for iPad and requires iOS 7 or later versions. There are many drawing tools available in the App Store. Unfortunately, most of these apps offer simple drawing and sketching tools with limited painting options. Standing above the rest of the pack is Drawing Pad, a highly acclaimed painting app that will transform your tablet into a virtual art studio. This application allows full-color freehand painting with options to enrich your work of art with stickers and custom backgrounds. Drawing Pad offers dozens of realistic drawing tools from basic pencils and pens to more sophisticated paint brushes. It allows you to mix and blend different colors so you can use custom hues that are perfect for your drawings. This app is truly an artist’s paradise. The user interface of Drawing Pad offers interactive menus that look like real objects. A blank white canvas is presented on screen when you start this app. Located at the side of the screen is the interactive drawer where you can find your drawing tools and other options. You can pull out this drawer to get the tools you need. And if you want more drawing space, simply tap the drawer to put it away. Drawing Pad offers 60 types of colored pencils, 70 different crayons, multi-colored felt tip markers, different types of paint brushes in various sizes, roller pens, dozens of craft papers, 140 customizable stickers, and four types of erasers. With such an impressive array of drawing implements, you will be able to easily paint your own masterpiece in no time. The app offers social sharing feature via email, Facebook, and Twitter. You can also save your works of art to the Drawing Pad album. If you want to print your creations, simply export your artworks to iPad’s camera roll album to allow printing via AirPrint. To make Drawing Pad more enjoyable for children, you can download more coloring books which are available as in-app purchases. And lastly, a video tutorial is available inside the app. Just watch the video to quickly learn how to manipulate the advanced features of Drawing Pad. 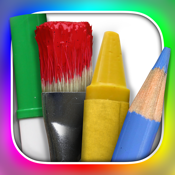 Drawing Pad is one of the most advanced drawing and painting applications in the App Store. This application has already received many accolades and awards from prestigious institutions. It is packed with sophisticated features that allow you to create your own masterpiece.